Like all new technology, learning how to get the very best out of your digital camera and printer can seem daunting at first. However, as more and more photographers plug into the creative possibilities of inkjet printing, now is the time to take the plunge! 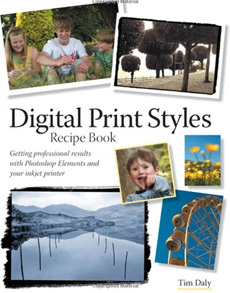 The Digital Print Styles Recipe Book assumes little or no prior knowledge of the printing process. Instead, each stage of the process is carefully dissected and explained in jargon-free terms. The very best prints start their life as top-quality image files that are accurately exposed “in camera”, then carefully prepared before printing. Yet, with so many software products available it can be difficult to know which is the best route to take. To start you off in the right direction, Chapter 1, “Hardware,”identifies the essential equipment you need and provides unbiased advice on practical solutions to fit all budgets. Covering computer types, performance, and storage, it also serves as a straightforward guide to setting up your own workstation properly. To whet your creative appetite, the second chapter, “Print Media,” will introduce you to the wide range of papers, fabric, and formats available to print with. With hundreds of different paper types, colors, and surface textures, sourcing the right media for your project can be a time-consuming process. To solve this, a recommended paper type is included with each practical project. If you’re unfamiliar with the underlying concepts behind digital data, then the Software Basics and Printing chapters provide you with all the underpinning knowledge you need to get up to speed with using Adobe Photoshop Elements and generic printer applications. Once you’re equipped with the confidence to experiment with paper types, sizes, and shapes, the next chapters, “Color Styles,” “Mono Styles,” and “Toning,” show you how to make your images more eye-catching. With simple but effective recipes available in Photoshop Elements and suggested paper types, your images may never look the same again! Unlike conventional photo prints made in the darkroom, digital prints can sometimes lack a personal touch. In Chapters 8, 9, and 10—“Edge Styles,” “Custom Prints,” and “Creative Media”—plenty of alternatives are illustrated, so you can add your own personal signature to your work, making it stand out from the crowd. “Finishing Touches,”“Print Services,” and “Resources’ the final three chapters, provide essential information on mounting and presenting your work, and finding professional services and suppliers for making one-off or special-sized output. I've read several books that allege to help you with producing fotos and printing them. Mostly they are too involved, this is a very simple book, it tells you all sorts of things but never more than you need: it is a very good starting point. Especially for people like me who don't want to sift throught tons of other info. All I want to know is, how do I do this or that - this books supplies those answers. Even better it's aimed at people who are using Elements and not PS. Another useful feature is the info about the paper used etc that accompanies the final print example. this not only gives you clues about all the paper types there are, but also why a particular paper was used in this case - and where to find them. 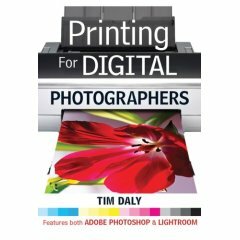 Tim Daly's book is a great way to start to get serious about printing, so buy it now if you want to start making better prints. Important Note: Despite this book's title, it is not just for users of Photoshop Elements; the advice, styles and methods (with, in a few cases, minor modifications) are easily transferable to Photoshop CS2-CS4. I feel this book is aimed at relative beginners in Photoshop Elements/Photoshop. With this in mind, beyond instructions for print making, the author assumes the reader can profitably use advice on understanding and selecting both computer and printing hardware. To accomplish this goal, Digital Print Styles' first 80-plus pages offer excellent guidance on topics including PC/Mac differences, monitor calibration, computer peripherals, software, printing set-ups and media selection (ink and paper). The heart of the book--the printing recipes--includes not only recommended Photoshop Elements/Photoshop instructions and settings, but also potential papers and ink sets to help achieve the desired effects. Print Styles' final sections assume, having created gorgeous prints, you'll want to do something with them. Therefore, in his final chapters, Mr. Daly offers suggestions and related resources for projects, such as, print matting and mounting, creating calendars and photobooks; transferring images to tee shirts and selling your prints online. Although I've been using Photoshop--and making my own prints--for some time, I still found more than enough new information and helpful tips in Tim Daly's Digital Print Styles Recipe Book to make it a very worthwhile read. Printing can be one of the great frustrations for digital photographers. Just how do you make sure that your print matches what's on your screen? And how do you get the most from the files taken on your digital camera? Experienced photographer and author Tim Daly answers these questions and many more, using jargon-free language to debunk the myths and mysteries of printing for digital photographers. Step-by-step sequences and screengrabs show you how to create a wide range of different print effects. There is also comprehensive guidance on controlling image quality and troubleshooting printing results.